Pour coconut milk into medium saucepan, and whisk. Transfer ½ cup coconut milk to small bowl, and stir in arrowroot. Set aside. Add sugar to coconut milk in pan; cook over medium-high heat, whisking often, about 5 minutes, or until just beginning to boil. Whisk in arrowroot mixture, and cook, whisking constantly, 3 to 4 minutes, or until mixture bubbles and begins to thicken slightly. Remove from heat; let cool to room temperature. Refrigerate 1 to 2 hours, or until completely chilled. 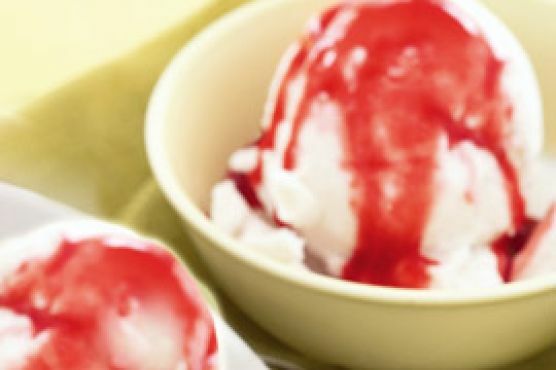 Process mixture in ice cream maker according to manufacturer�? ?s instructions. Transfer ice cream to container, cover and freeze until firm, about 1 hour. To make Raspberry Sauce: Purée all ingredients and ½ cup water in blender or food processor. Strain through fine mesh sieve set over small bowl. Sweeten with more syrup, if desired. Serve over Coconut Ice Cream.